After Barbara Scheel finishes a long day of teaching, she doesn’t return home right away on Monday nights. Instead, as she has for 20 years, she climbs into her car and heads to rehearsal with the other 120 volunteer members of the Seattle Symphony Chorale. “I love singing with the Chorale because of the sheer joy I get from singing with outstanding singers and musicians who are also my friends,” said Scheel. This year the Chorale, which is directed by Associate Conductor of Choral Activities Joseph Crnko, will perform six times with the Seattle Symphony. In December the Chorale will perform Elgar’s deeply moving masterpiece, The Dream of Gerontius, with British conductor Edward Gardner. Although the piece is rarely performed, it is one of Elgar’s greatest masterpieces, surpassing even the cello concerto and his beloved Enigma Variations. Based on a poem by John Henry Newman, the music traces the journey of the soul after death. Elgar’s score calls for a large orchestra, double chorus, semi-chorus and three soloists. During the first part the main character, Gerontius, is preparing for death. In the second part he has passed on and is met by an angel who guides him through the afterlife. The music is richly imaginative and deeply rooted in the English Romantic tradition. Throughout the work, the Chorale fills the role of mourners, demons, angels and souls banished to Purgatory. Just after the start of the year, Music Director Ludovic Morlot brings us a joyous celebration when he conducts Beethoven’s Symphony No. 9 with its famed choral “Ode to Joy” finale. This year he is pairing the Beethoven with a work by French composer Olivier Messiaen, Trois petites liturgies de la Présence Divine. Scored for piano solo, ondes Martenot, women’s chorus, percussion ensemble and strings, Messiaen’s Trois petites liturgies de la Présence Divine is resplendent with other-worldly harmony. Morlot has invited the Northwest Boychoir to perform instead of a women’s chorus to evoke the liturgical traditions that inspired Messiaen. Written after he was released from a German prison camp in 1941, the music is a celebration of life and God’s presence that dwells within us and binds all things together. The music glitters and shimmers with percussion and piano interjections over the sighing, searching sounds of the strings and voices. The biggest event of the season, however, might be Morlot’s semi-staged presentation of Ravel’s opera, L’enfant et les sortilèges. The libretto by French novelist Sidonie-Gabrielle Colette tells the magical story of a spoiled child whose unhappy toys come to life. Ravel’s score ingeniously blends waltz, opera, ragtime and jazz to bring a host of fairy tale characters and little animals to life. The most remarkable moment of the opera, however, isn’t the dancing chairs, flying bats or wailing cats — it’s Colette’s cry, orchestrated by Ravel, of the animals calling out “mother” in the final scene. The music builds from a shaky bass line into a rapturous, fugal chorale as the animals summon the child’s mother to bring him inside to safety. 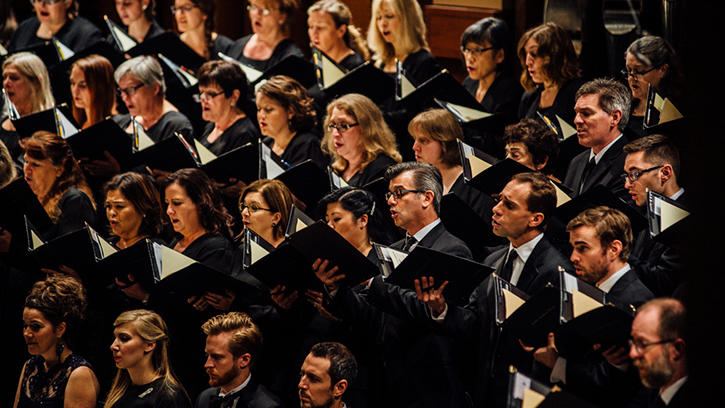 Book now for the best seats to hear the Seattle Symphony Chorale with Music Director Ludovic Morlot and the Seattle Symphony!